The nature of memory always fascinates me. Just how much can we rely on our memories – what is real and reliable, how well can we really remember what happened, how much do we bury in our subconscious? 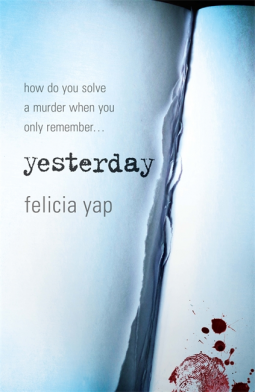 In Yesterday by Felicia Yap she has created a world where memory for everyone over the age of eighteen is limited for 70% of people to just one day (the Monos) whilst the rest (the Duos) have two days of memory. Each day everyone has to write down their actions, thoughts and feelings in their iDiaries and then memorise the ‘facts’. But are these ‘facts’ reliable? This is a murder story, told through extracts from iDiaries and the perspectives of four people, that of the victim, Sophie, Claire a Mono, married for twenty years to Mark, a novelist and prospective MP who is a Duo, and DCI Hans Richardson, who is racing against time to find the murderer. I found it rather confusing at first, getting my head around the fact that everyone has such a short-term memory. Just how reliable are the four narrators, are they even who they say they are and do they write the truth in their iDiaries? I think it is an interesting book but I did have to suspend my disbelief, especially towards the end of the book, which I found farcical and rather annoying. It was one twist too far for me. And I couldn’t really get over the fact of how much time you would have to spend writing everything down and then learning what you had done and thought each day. Hmmm….it sounds like an interesting premise, Margaret, but I can see what you mean by disbelief. Not sure it’s for me, but it does sound interesting.